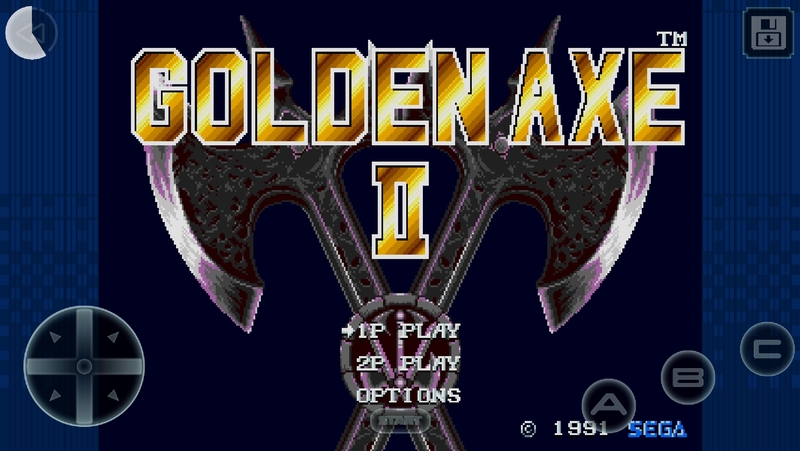 The screenshot above is what you'll be greeted with when you boot up Golden Axe Classics. All three games in the series are now included in the title, and notably, the third release was something the majority of gamers never got to play in the US when it first came out thanks to its exclusivity to the oddball Sega Channel online game service for the Genesis. It has since been included in a few different Sega collections over the years, but I bet there's a good amount of people out there that have still yet to play it. Now, you may be asking yourself how well these games control on a touchscreen, and the answer is sadly not all that well. The games were designed for precise controls, which is difficult to pull off on a touchscreen, and despite the description on the Play Store that claims HID controllers are supported, it would appear the emulator used for these classic games still doesn't work correctly on that front since none of my HID controllers actually work with the game. Nothing new for a SEGA Forever release, but definitely something to keep in mind. Like all Forever titles, you can play for free, but there will be advertisements. You can remove the ads from each title by plunking down $1.99 a piece through in-app purchases, but you also have the option to pay $4.99 in one lump sum to remove the ads from all three games. On the one hand it's nice to see Sega supporting its Android games with new updates that include new titles to play, but on the other I really wish the company would sort out its emulator and controller issues, because poor performance and a lack of precise controls really brings down the experience of playing these classics. I suppose it isn't a big deal if you plan on playing for free, but for those of us who'd like to remove the annoying advertisements, it's difficult to justify the expenditure when the product is of such low quality.